Established in 1971, the Shambhala Meditation Center of Los Angeles is part of a global community of meditation and retreat centers founded by Chögyam Trungpa Rinpoche and led by Sakyong Mipham Rinpoche. Our Los Angeles Centers, located in Eagle Rock, Mar Vista (Westside), and Orange County offer meditation programs, a core curriculum of Buddhist and Shambhala teachings, as well as training in advanced contemplative practices. Weekly Dharma Gatherings and public meditation are also available in Carpinteria and Ojai. Shambhala Meditation Center of Los Angeles is part of Shambhala, a global social movement to bring kindness, insight, meditation, and sacredness into society. It is the Shambhala view that every human being has a fundamental nature of goodness, warmth and intelligence. This nature can be cultivated through meditation, following ancient principles, and it can be further developed in daily life, so that it radiates out to family, friends, community and society. In the course of our lives, this goodness, warmth and intelligence can easily become covered over by doubt, fear and egotism. The journey of becoming fully human means seeing through fear and egotism, and waking up to our natural intelligence. It takes kindness–to ourselves and others–and courage, to wake up in this world. The journey of awakening is known as the path of the warrior, as it requires the simple bravery to look directly at one’s s own mind and heart. The essential tool for doing this is mindfulness meditation. As we continue on the Shambhala path, we learn many other practices, to help us break through the ancient crust of ego and awaken to the joy of fully living in this world. Awakening and opening, we discover the world to be naturally sacred, pure and full of beauty. We begin to see clearly the goodness and wisdom of others, and to feel compassion to help them in myriad ways. Shambhala vision is rooted in the contemplative teachings of Buddhism, yet is a fresh expression of the spiritual journey for our time; it is available to practitioners of any tradition. Our lineage draws on the wisdom of the Kagyu and Nyingma schools of Tibetan Buddhism, as inherited by founder of Shambhala, Chögyam Trungpa Rinpoche, and his son and spiritual heir, Sakyong Mipham. 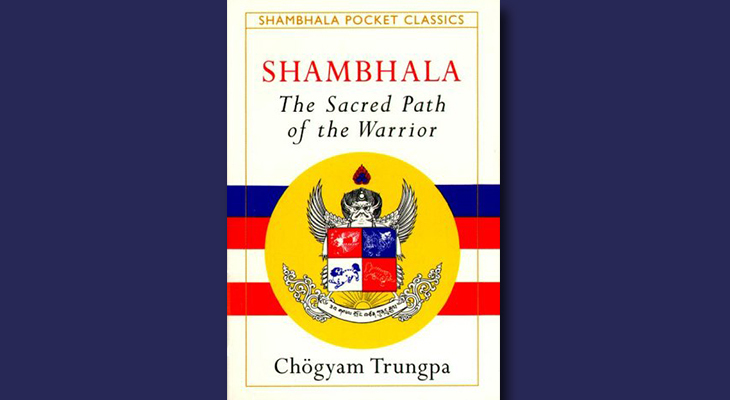 In the mid-1970’s Chögyam Trungpa Rinpoche began to introduce teachings on Shambhala vision, based on his encounter with the Western world, and on the specific wisdom imparted from the Buddha to King Dawa Sangpo, the first sovereign of the legendary kingdom of Shambhala. This tradition teaches how to live in the secular world with courage and compassion.